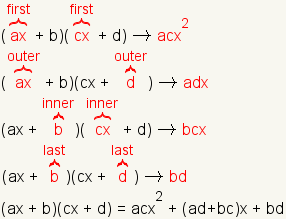 FOIL Method: An algorithm for expanding the product of binomials. First, Outer, Inner, Last. The FOIL method is an algorithm for expanding the product of two binomials. FOIL is an acronym that stands for First, Outer, Inner, Last. How to Use FOIL to Distribute Two Binomials (video) . dummies.com. Wiley. 1/23/2010. http://www.dummies.com/how-to/content/how-to-use-foil-to-distribute-two-binomials.html. McAdams, David E. FOIL Method . 4/21/2019. All Math Words Encyclopedia. Life is a Story Problem LLC. http://www.allmathwords.org/en/f/foilmethod.html.